This week was a busy one as we have entered full swing into the diversification section of our applied skills course in the Applied Sustainable Ranching Program here at Thompson Rivers University in Williams Lake. 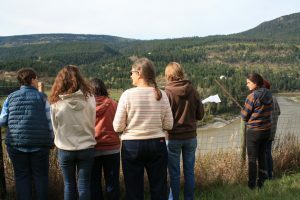 For our first diversification seminar we traveled out towards Soda Creek, along the Fraser River in the Cariboo and found ourselves at Fraser Bench Farm and home of Charlie and Lynda Archibald. 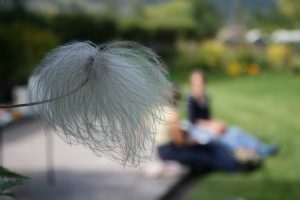 Lynda’s place is incredible, and a real testament to the idea of “staying in place” -she’s been on that site for thirty years, and the establishment of her trees, and berry bushes and flowers shows it. Lynda has a successful raspberry enterprise where she grows, picks and sells fresh and frozen berries. She is a great example of diversification as she has several businesses on her farm. 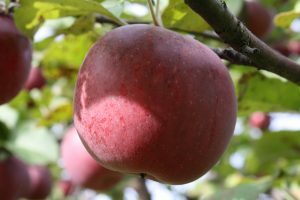 Lynda has created diversification with her apple orchard with apple sales, juice sales and she creates her own apple cider vinegar product that is in high demand. She is part of the Cariboo Grower’s co-op and grows onions and early garlic for them to sell in Williams Lake. 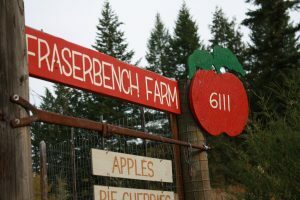 Her set-up was simple and showed that with a little creativity setting up an additional enterprise on your ranch or farm could be easily established. 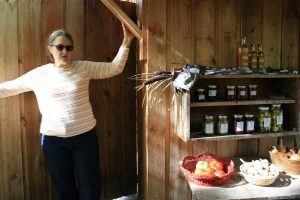 We enjoyed Lynda’s farm so much, spending a lot of time learning from her, but also a lot of time sitting on her deck in the warm micro-climate, basking in the sun and flowers. No wonder she has invested so much of her time in this beautiful place, how could you not? 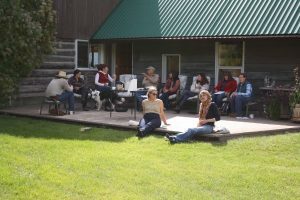 At the end of August the trifecta of ranching happened when the Gang Ranch- one of the largest ranches in Canada met Stockman Clinician Curt Pate, and a group of students from the Thompson Rivers University’s newly minted Applied Sustainable Ranching Program. 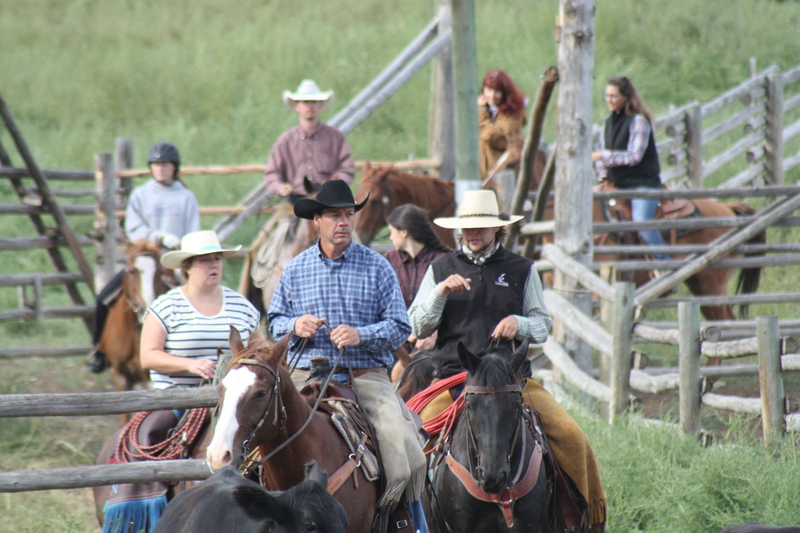 It was a testament to the program’s commitment to industry partners to have organized this coming together, and a witnessing of industry support in the endeavor to educate up and coming ranchers and their diverse enterprises. Students prepared ahead of time, packed up horses and tack, loaded their trailers and set off down the road last week, headed for the Gang Ranch. Curt Pate began his formal training 25 years ago, and now passes along his skills and knowledge in stockmanship onto his students through demo’s, clinics and on-site training. Students were lucky to have spent three days on the scenic and historic Gang Ranch for this clinic with him. These values and beliefs are mirrored in the Applied Sustainable Ranching Program, and students had the opportunity to spend time and learn from Curt about managing livestock and realize how important those livestock handling skills can be. Livestock skills are important for places such as the Gang Ranch, primarily a cow/calf operation that covers over a million acres. The history of the Gang Ranch is rich with stories of cowboys, horses, and cattle on this long running operation. Unique to this large area are the canyons, rivers and mountain hillsides that cover large and diverse climactic zones for cattle to graze. working hard in the Applied Sustainable Ranching there are some very good teaching moments, to a very receptive audience. Unforgettable moments in a vast landscape. The essence of ranching, and the best in the legacy of cattle culture.